Signature Photo booths are available for rental in the Sacramento area and is a great way to add something special to your event. It's a great way for your guests to leave with a keepsake that they can share for years to come. 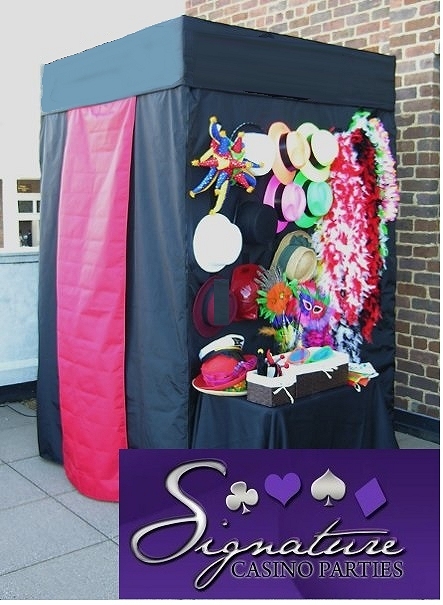 Photo Booths are ideally suited for any type party, wedding, graduation party, school prom, bat mitzvah, promotion, casino events and lots more. Rent a photo booth from us and your guests will be talking about it for years to come and will have the pictures to prove it! Our Photo Booth is designed with the latest in ultra-high resolution digital technology. Our proprietary system leverages professional-grade camera's with lab quality photo printers that generate prints within seconds, but guaranteed to last generations. We are proud to lead the industry by giving you a Signature experience. We understand the importance of your special occasion and we are committed to making your memories last a lifetime. Our professional hosts will deliver & set up your Booth and ensure that you and your guests are entertained while using our services to its maximum potential. We take care of everything from start to finish! Our booths have been specially designed to have a small footprint while being able to fit up to 10 guests. The technology and equipment inside your booth utilizes our proprietary system that has been developed by special engineers. Our props are guaranteed to add a lot of laughter to your event. With hats, glasses, moustaches and love hearts our props will provide hours of fun for your guests. and did we mention .... they are included with your Booth Rental .... well they are! ... Free that is!